NEW FOR MAY 2018. AUXILLIARY BOARDS. We are strongly pushing these new "AUX-BOARDS" for many new installations. Click on the link to this new page of the Sustainiac website. Most of our customers prefer toggle controls, and also push-pull for ON/OFF and toggle for Harmonic mode. The new Aux boards accomplish this with greatly simplified installation process, at a cost option of $10.00. The amount of labor saved and consistency of sustainer performance more than justifies this cost add-on. In fact we are so overwhelmed with back-orders on full installations and Semi-Installations that we would like for our customers to give very strong consideration to this new option. Scroll down the page, or use the topic headings to jump down to the various topics. Then, use your browser "BACK" button to return to the TABLE OF CONTENTS. NOT-RECOMMENDED GUITAR TYPES AND OTHER "NO-NO's"
SEMI-INSTALLATION : We do 90% of the work. No shipping of your guitar. ABOUT YOUR GUITAR Things you need to tell us when you order. A list of DETAILED TOPIC/INSTALLATION DRAWING LINKS is contained near the bottom of this page, including pages that detail actual installation drawings, specific guitar types, details about Sustainiac control options, PDF file of the owner's manual, a PDF about guitar controls (how they work), etc. THE MAIN THING TO SEE is that the wiring in the RE-DONE INSTALLATION picture is much neater than the IMPROPER picture. The wires are much shorter. Also they are carefully routed to minimize crosstalk. The Sustainiac circuit board in the IMPROPER picture is oriented BACKWARDS from our hookup diagrams. You ALWAYS want the 8-PIN CONNECTOR to be close to the pickup selector switch. That is the right-angle connector near the left side of the "RE-DONE INSTALLATION" photo. If you don't do that, then the white and orange wires of the 8-pin connector will have to extend a long way to reach the pickp selector switch as shown in the IMPROPER INSTALLATION photo. The white/orange wires both carry bridge pickup signal. They are high-impedance, and therefore can easily "pick up" high level Sustainiac signals from the circuit board and other SIGNAL RADIATOR wires. This creates "CROSSTALK". This results in UNCONTROLLED OSCILLATION (SQUEALING). Notice the violet/gray twisted pair in the FIXED INSTALLATION photo. It has been moved to the top side of the photo, well away from all guitar signal wires, controls etc. The violet/gray pair are SIGNAL RADIATOR wires. By moving them away from pickup wires wires and contacts, the violet/gray wire pair cannot cause crosstalk. SUSTAINIAC WEBSITE MAP: The overall site map is at the very bottom of each page, including the ORDER FORM, our email address, phone number, shipping address etc. A list of INSTALLATION OPTIONS AND DETAILS is shown at the bottom of this page. Links to PDF installation drawings of specific guitar models are shown, as is a PDF copy of the installation manual. But first, read the following few paragraphs for an installation overview. 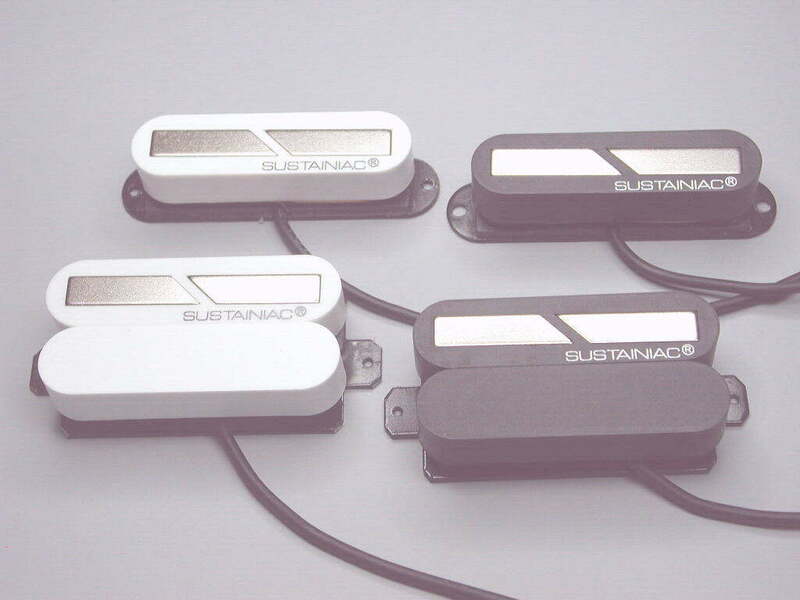 The Sustainiac Stealth PRO sustain system is a retrofit sustainer for existing electric guitar. 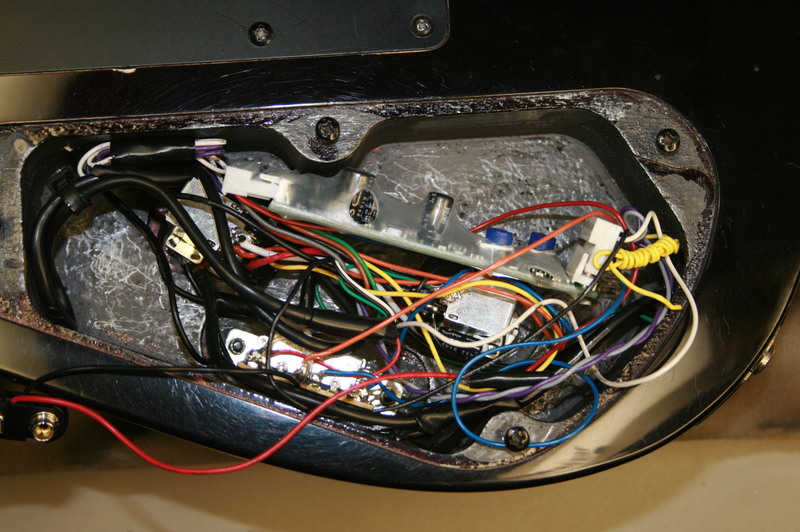 The installation requires substantial rewiring of the guitar electronics cavity. 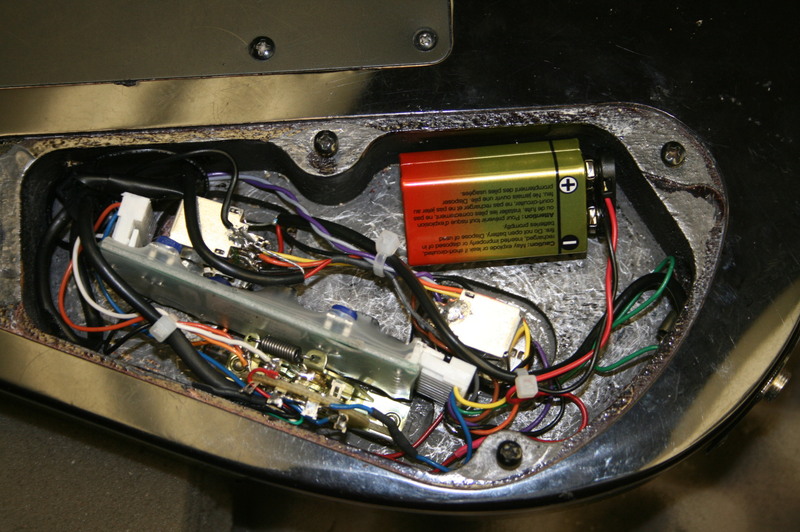 For most installations, no routing or drilling of the guitar electronics cavity is required if you use the standard two PUSH-PULL POT/SWITCH controls for ON/OFF and for Harmonic Mode that are supplied with the kit. If you choose the optional TOGGLE-SWITCH controls to control the Sustainiac, you will likely have to drill holes in the guitar body. If you are familiar with electronics assembly, soldering, and following wiring diagrams, you can likely handle the installation. It is much more difficult than, say, replacing a pickup or volume control. Many guitar technicians can handle the installation, but many call us for help. An excellent woodworker isn't necessarily equipped to handle an electronic wiring job of this complexity. Know your technician before letting him/her take this project on. It will usually take between 3 and 10 hours, depending on the guitar model and the experience of the installer and the guitar type. Pickguard guitars take longer. Parker Flys take many hours. Alternatively, you can have Maniac Music do your installation. We will totally install the system into your guitar for approximately $125- $175, depending on the guitar type. We charge extra for routing. For instance, if you want us to install the optional battery case ($16.00), we charge $25.00 to route the cavity for this. The easiest installation is into guitars with electronics cavities that open from the back, and are roomy. This includes most "shredder" type guitars with H-S-S pickup configuration, and many 2-HB guitars. Gibson Les Pauls are not so roomy but do-able. Generally, these are $125 unless unusual problems are encountered. Next in difficulty is any pickguard guitar, such as Stratocaster and Ibanez Jem. We charge $150.00 for these. The problem here is that you have to remove the pickguard to do any adjustment, then fit everything back together again. It can involve multiple disassemblies/assemblies before everything is working smoothly. Also, we have to remove all the shielding foil from around the pickup area. A labor-intensive process. NOTE: Newer Jem guitars use a new VLX-91 switch that is wider than the old VLX91. This new wider VLX 91 takes up so much room inside the tiny Jem cavity that the Sustainiac circuit board will not fit into the cavity. Therefore, we have to create a new cavity under the pickguard for the Sustainiac board. Add $25 if this is the case. The Parker Fly (original version with large Fishman board and "octopus" ribbon cables) is $175. The new point-to-point version is a little easier, $150. Shipping your guitar to Maniac Music: Click here for PDF instructions: Shipping guitars. There are several things you must consider when planning a Stealth PRO installation. Each kit shipment is somewhat custom, based on your particular guitar type. Our kits are not "one size fits all" because guitars are not "one size fits all". Read the following list, and determine what you need for your particular guitar. These choices are listed on the order form. You will need to make the proper choices to get the proper parts assortment and hookup drawing in your kit. Then, after you have reviewed everything, you should visit our ORGANIZE YOUR ORDER page when you think you are about ready to place an order. You can print this page, and use it for your guide. It allows you to list and outline your installation plan, and it makes it easier to navigate the Order Form. DRIVER SIZE AND COLOR: The Sustainiac driver replaces your neck pickup. The driver becomes an active neck pickup when the sustainer is OFF. The driver is available in two sizes (HB and SC) and two colors (black and white). The Sustainiac driver low-resolution (11KB) and Sustainiac driver high-resolution (55KB) photos show the options. The SC-size drivers can be ordered with either woodscrew mounting (for guitars having no pickguard or mounting rings) or threaded, for use on guitars with pickguards. NOTE: The HB size driver and the SC size are IDENTICAL. The only difference is that the HB driver is mounted onto a HB-size baseplate. A plastic "dummy" cover is then attached to the driver to fill up the cavity in order to fill up the spqace. CONTROLS: The standard kit comes with controls for ON/OFF and Harmonic Mode. You can choose both as push-pull, or optional toggle switches for either or both controls at no extra cost. Or, choose other unusual and useful options. Some of these involve rather exotic ideas, such as a one-lever, 5-position Superswitch control for the sustainer, or even a single lever control for both the guitar AND the Sustainiac. Visit the SUSTAINIAC CONTROLS page for a detailed look at the options. Any guitar with more than 24 frets: Use another guitar. The space between the bridge pickup and Sustainiac driver is quite small. This creates magnetic crosstalk between driver and bridge pickup, resulting in uncontrolled oscillation. This means that you have to turn the sustainer gain down to stop the resulting oscillation. Sustainer performance suffers so much that you might as well not even have a sustainer. We need 3 inches MINIMUM spacing between bridge pickup and Sustainiac driver (measured center-to-center). 3.5 inches is even better. Placing the driver in the middle pickup position: The problem is the space thing again, between driver and bridge pickup. Any guitar with a slanted neck pickup. Use another guitar. The slant will compromise the magnetic balance between the Sustainiac driver and the bridge pickup. You have to turn down the sustainer gain so much to stop the resulting oscillation that you might as well not even have a sustainer. Telecasters with single-coil bridge pickup. Use another guitar. The extreme slant of the bridge pickup will compromise the magnetic balance between the Sustainiac driver and the bridge pickup. Use of the magnetic-balance tab will not fully correct this. Harmonic mode will generally not be very good. But, Tele's with a humbucker bridge pickup works out fine, even mini-humbuckers with the slanted cavity. Incompatible bridge pickups: Our "bilateral" driver design works great with most common bridge pickup designs, including most active pickups (such as EMG etc.). Some bridge pickup designs are not compatible and cannot be successfully used. Good magnetic cancellation is not possible, and sustainer performance will be compromised. Novel new pickup designs continue to be developed by clever people. Some are not compatible. This is no criticism of the quality of these pickups. It is merely a statement of how well the Sustainiac will work with these pickup types used to furnish the input signal to the Sustainiac. Offset pickups, like G&L Commanche, or "P"-bass type pickup. (Some of these are concealed by a permanently-attached plastic top. The only way to tell is to use a permanent magnet to determine its polepiece configuration.) The Duncan "Vintage Rails" is a split pickup with this type of appearance. Neo-Vin model Neo-9 neodymium pickups (which looks like a normal single-coil or stacked design pickup, until you remove the cover and see a dual rail design with non-magnetic "dummy" polepiece arrangement attached). Seymour Duncan "Blackout" active pickups" These work OK, but you can't run the Sustainiac driver wire near the bridge pickup. Even though the Sustainiac driver wire is shielded (for electrostatic pickup), the magnetic sensitivity of these pickups is so great that the driver wire cannot be run anywhere near them. Using the middle pickup for Sustainiac input signal, or listening to it. : The middle pickup will then provide the input signal to the sustainer (if it is blended with the bridge pickup signal). The system will oscillate (squeal). However, if you connect the bridge pickup to the sustainer input, and listen only to the middle pickup (without blending it with the bridge pickup signal), you can listen to the middle pickup. The signal will likely have some distortion in it because of its proximity to the driver. Pickguards with aluminum or copper "mirror" effects, or some metallic finishes on the guitar body: Remove the foil from around the pickp area on pickguards. The magnetic pulsations from the driver induce pulsating "eddy" currents into the conductive aluminum or copper. These in turn radiate their own magnetic pulsations. The bridge pickup responds to these magnetic pulsations. The end result is that the desired magnetic balance between driver and bridge pickup is compromised. We remove the shielding foil that comes on US-made Strats and Jems from around the pickups. You can keep the foil over the electronics cavity. If we do your installation into a Strat, Jem, etc., then we include this service. Metal pickup trim rings: Mostly, these are OK. But sometimes it produces the same problem as #6. If you experience distortion or uncontrolled oscillation, try switching to a plastic trim ring. If the problem goes away, that was the reason. Crowded electronics cavity: Having other effects inside the electronics cavity exposes the guitar signal to more electric crosstalk from the Sustainiac circuit board and signal wires. Concealing the driver: If you cover up the driver (to fool people into thinking you are Superman), you move the driver farther away from the strings by the thickness of the cover. This reduces the sustainer performance. Paint should work OK. Using a metal cover upsets the magnetic balance of the driver. ES335 etc. are very difficult since there is no cavity access. Placing a single-coil pickup next to the driver: This does not work well. The Sustainiac works fine, but the side-by-side permanent magnetic fields of our patented bilateral driver "bend" the field of a single coil pickup. The result is that the sound of three of the strings will have about 6dB lower output level than the other three strings. Same for a humbucker with "stacked" coils. A mini-humbucker with conventional "side-by-side" coils pickup doesn't exhibit this problem as much. In our opinion (and that of most customers), the Sustainiac driver sounds better than most mini-humbuckers. It also has the new dual-sound feature. DRY-RUN INSTALLATION You can do a "quickie" installation on any questionable guitar to determine its suitability. Click here for a PDF file of the whole procedure: "DRY RUN" TEMPORARY INSTALLATION Click here for a PDF diagram: "DRY RUN" DRAWING It takes about 15-20 minutes. Install the driver, and hook up the bridge pickup to the sustainer input, connect a battery and a few other wires to ground. Connect a guitar amp. This will instantly tell you if this guitar will be suitable. We do this on many guitars to save headache/heartbreak. "GENERIC" Semi-installations for most rear-cavity guitar types. ABOUT YOUR GUITAR We need to know some specific information about your guitar so we can send the proper hookup diagram and parts with your kit. What kind of output jack do you have (open or barrel style)? Each kit comes with a replacement jack (stereo) that replaces your existing guitar jack, in order to activate the Sustainiac battery when the guitar plug is inserted. To determine what style you have, Click on either picture: Output jack choices, low resolution (10kb); Output jack choices, high resolution (70kb). Open-style, shown on the upper left, usually mounts to a metal plate on the side of the guitar, or a special plate such as Stratocasters have. Open style has a visible hex-nut that is threaded onto the outside of the jack. Barrel-type (bottom of picture) has a flange, with no external mounting nut (mounting nut is inside the guitar body). 9-pin stereo jack The 9-pin jack (upper right side of picture) is a special jack, having internal switches that connect/disconnect two or more separate batteries. If you use active electronics in the guitar (such as EMG pickups), you need to use separate batteries, one for the EMG's, one for the Sustainiac. This requires replacing your existing guitar jack with a special 9-pin jack.. Click on the for a PDF file which shows how the jack is used, and why, and how it is hooked up. We have more info on output jacks, and how they are hooked up with the Sustainiac, in our ABOUT GUITAR CONTROLS, a PDF document. How many pickups does your guitar have? One, two, or three. Select on ORDER FORM. What type pickup selector does your guitar have? Select on ORDER FORM. Each drawing is based on the pickup switch type. Please know what you have before you order. "CRL" switch. Has 8 contacts, 4 on each side of the wafer. This is the switch that Fender has used for decades. Simple, reliable, good "feel" when switching. Open construction so you can observe what is happening. "Superswitch": Has 24 contacts, 12 contacts in a line on each of 2 sections. Has open construction so that you can see the inner workings of the switch. It is often used with coil-tapping schemes of the bridge and neck pickups, to create Strat "quack" sounds. See picture and more info on the Controls Page. "VLX-91" switch used in many Ibanez guitars. Has 24 contacts, similar to Superswitch. 2 wafers, 6 contacts on each side of each wafer. See picture and more info on the Controls Page. Individual toggles for each pickup (some "shredders" and custom guitars). Some other arrangement. We need a detailed explanation, or we can't provide a useful drawing. We have more info about pickup selectors, and how they are hooked up with the Sustainiac, in our ABOUT GUITAR CONTROLS, a PDF document. You should visit our ORGANIZE YOUR ORDER page when you think you are about ready to place an order. This page allows you to list and outline your installation plan. It makes it easier to navigate the Order Form. You can refer to our WIRE FUNCTION DIAGRAM for a description of all the Stealth PRO wire functions. (20KB PDF file). This description can be a big help when troubleshooting an installation. DETAILED INSTALLATION TOPICS, SPECIFIC GUITAR DRAWINGS ETC. The following list links you to different guitar models, also to various kit options and configurations. Click on the list topics below to download detailed information, hookup diagrams, and pictures. PDF file of Stealth PRO Installation Manual (One copy of this manual is included with each kit. The Installation Manual does not include any hookup diagram. Separate PDF drawings can be viewed on the respective page for each guitar type below. Each kit comes with the proper hookup diagram. When you order your Sustainiac kit, we provide the most appropriate diagram for your guitar. If you are technically inclined and interested in creative options, browse our numerous hookup diagrams to get ideas that you might not have thought of for a sustain system for your needs. SUSTAINIAC CONTROLS page Each kit comes with ON/OFF and Harmonic Mode controls. Use this info to choose which control type you prefer for your installation kit. Here we present some unusual control options that we have used over the years that many people have found helpful. 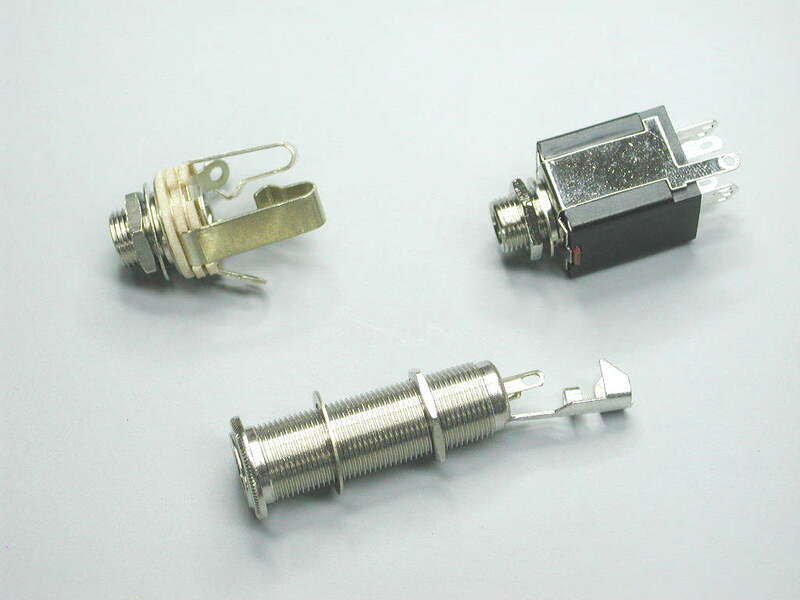 Superswitch, and VLX-91; PDF file These 4-section switches allow coil tapping and other options. Guitar Controls; PDF file Detailed, useful info for those who want to know more. Also helpful for troubleshooting. Stealth PRO Troubleshooting; PDF file Detailed troubleshooting procedure for the Stealth PRO. Stealth PRO wire function diagram; PDF file; detailed diagram showing the function of each wire. How to determine pickup polarity; PDF file; This PDF file shows how to test the polarity of your BRIDGE PICKUP. Micro-ammeter (old-fashioned needle-type meter) required, or oscilloscope. If you don't have these, hook up the sustainer. If all modes work correctly and are strong, you are OK. If there is no NORMAL mode, and all positions of the MODE control are weak, then the pickup has reverse polarity. Simply reverse the red/black driver wires to correct. Guitars with active pickups, EMG etc. Parker "Fly" guitar, also "Nitefly"